To say that Oregonians are spoiled with great outdoor recreation opportunities is a bit of an understatement. Even in Portland, the most populated city in the state, there are some pretty awesome mini bike adventures not too far out of town. We decided to take advantage of the unseasonably warm and sunny weather this week to do our February bike overnight for the #BikeTourR12 Challenge. 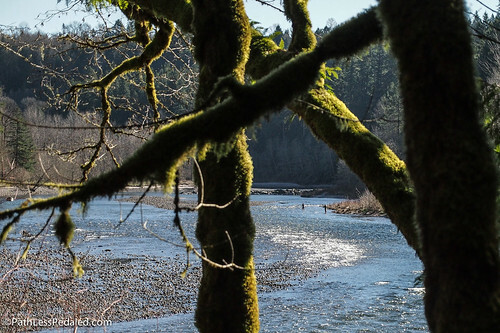 I knew I wanted to get some fishing in so we chose Oxbow Park that is situated right along the Sandy River. First time combining an overnight bike trip with all the steelhead fishing gear. There are many ways to get there, but our current favorite way is a little meandering route that puts you on some quaint country roads that pass plant nurseries and farms. You can do this ride two ways depending on how much riding you want to do. You can take the long way from Portland via the Springwater Corridor or you can take the MAX out to Gresham and ride from the end of the line, which is what we did this time. The road into Oxbow Park is a little treat in itself. Once you get off the MAX, there is a little suburban unpleasantness to ride through but plenty of opportunity to pick up some last minute supplies you might have forgotten (Walgreens, Market 7, etc.,). 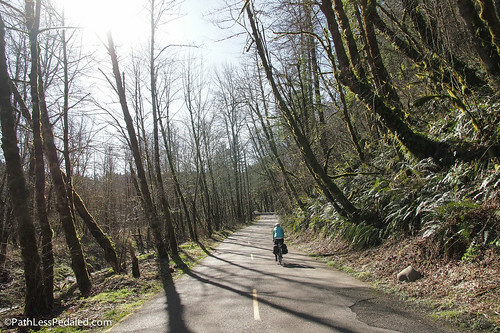 After about 2 miles, you get on the Springwater Trail that parallels SE Telford Road. It runs along Johnson Creek, which this time of year has a pretty good flow of water through it. A little before mile 4, you leave the trail and get on Stone Rd. and deal with the only bit of traffic unpleasantness on the route, crossing Hwy 26. It is a big 4-lane highway, with no signals at that intersection, making it tricky to cross when it is busy. On the way to Oxbow, we were lucky that there wasn’t much traffic so we made it across fairly easily. Coming back, there was more traffic, so we had to cross it in two stages. We waited until the traffic on our side was clear then rode to the painted traffic island by the left turn pocket; when that side of traffic was clear we crossed the rest of the way. It is not ideal, but if you cross in two stages it is easily manageable. Once you get past that nastiness you are on a gem of a country road that is very lightly trafficked. You eventually get on Dodge Park Blvd, a long straight country road that on a clear day will give you great views of Mt. Hood in the distance. There is a country market and restaurant along the way that always smells like it has some awesome BBQ cooking that we quite haven’t made it to yet. Once you are on Hosner it is a straight shot to Oxbow Park. 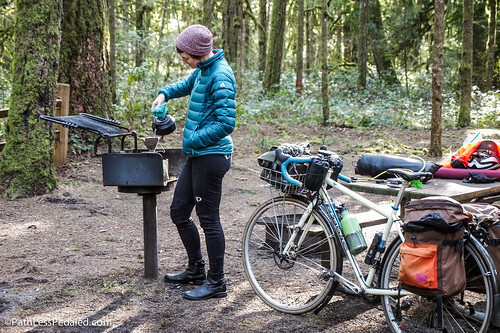 The BBQ grills at the campsites make great #coffeeoutside stations. Now is probably a good time to talk about The Hill. The Hill is about 1.6 miles and drops/climbs (depending if you are going in or out of the park) 600 feet to river level. It is steep. There are short stretches of 14-15% that make it a memorable experience either way you ride it. There are occasionally some rough patches on the road so keep your eyes peeled and speed in check coming down. The Hill, unfortunately, deters people from attempting to bikecamp at Oxbow more often. It is a tough hill to ride up, but it is short in the grand scheme of things and there is no shame if one decided to take in a bit more of the scenery and walk up it. It doesn’t go on forever (even though it may feel like it when you are pedaling). The Sandy River, worth grunting up The Hill. After descending The Hill, you’ll pass the entrance to the park (bikes enter for free!). Past the entrance there are about two more miles until you get to the actual campsites. The road through the park is a fun little ride that rolls and curves with great views of the Sandy River below. The campsites were blissfully empty when we arrived. During peak summer months, they fill up easily on the weekends. If you have a flexible schedule, mid-week during shoulder seasons are best for peace and quiet. 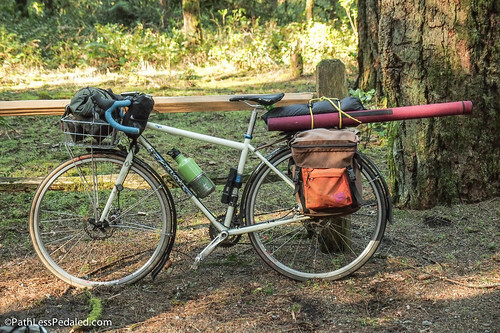 Campsites cost $22 per site and firewood is $5 a bundle. We had stopped at a convenience store to pull cash, but were pleasantly surprised to learn that the rangers at Oxbow now take credit cards! The rangers on duty were exceptionally nice! Seeing that we were on bikes, they offered to drop some wood off with their truck. 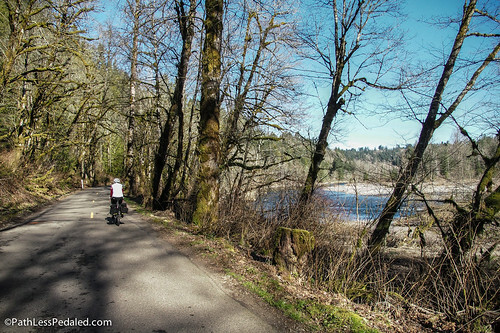 The road in the park is twisty, rolly and offers great views of the Sandy River. After we got our tent set up and afternoon coffee made, we soft pedaled down to the boat ramp along the Sandy. There is a big swath of pebbly beach and we walked down a little ways with the bikes to find an empty spot. Laura wrote in her journal and I donned the waders and boots. 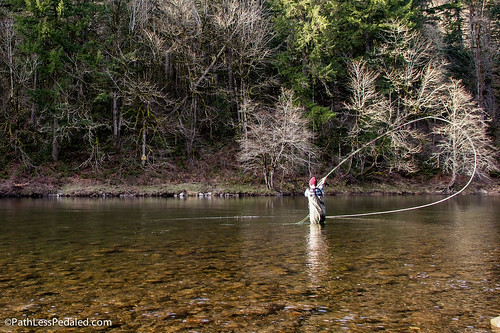 The Sandy River is a well regarded steelhead river. During steelhead season you’ll see people floating down the river fishing every few minutes like a ride in Disneyland. Oxbow Park is unique in that it has a lot of bank fishing opportunities for steelhead. I’ve come out to Oxbow about half a dozen times exploring a few hundred feet with each visit. For the bank fisherman, you could spend years unlocking the nuances of the different runs in the park. I haven’t quite spent that much time there, so I’m still bumbling along trying to figure out where the good water is. If I were a fish, which would I eat? 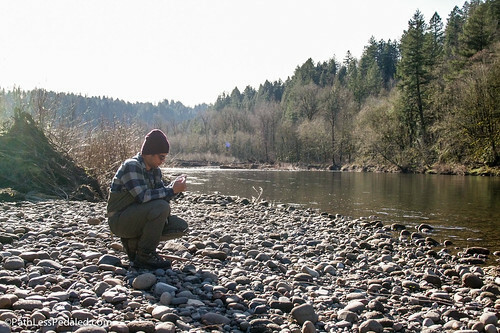 Still amazes us that prime steelhead fishing water can be reached by transit and bike. Steelhead are notoriously fickle fish (affectionately called “fish of a thousand casts”, though by the count I’m more than overdue), and many a fisherman has gone through an entire season without bringing one in. At worst it is an absolutely maddening Quixotic experience standing waist deep in cold water, swinging rod and reel in the air like a daft magician trying to conjure up a giant rabbit. But even in those moments where you question your sanity about the whole endeavor, it still beats a lot of other things you could be doing with your time. It felt oddly good to stand there with the warmth of the sun on my face, slowly working down river to the cadence of a snap-T cast as my left foot went slowly numb from the frigid water (have to find that hole in my wader that time). That’s why its called fishing and not catching, right? Once the sun dipped below the trees we started a campfire, made dinner and enjoyed the rare clear February evening in Oregon. Morning was leisurely and included a healthy sized campfire and multiple cups of coffee. We packed up and rode out around 10:30am and took the same route home and were back home by 1:30pm. We did manage to catch some great views of Mt Hood. 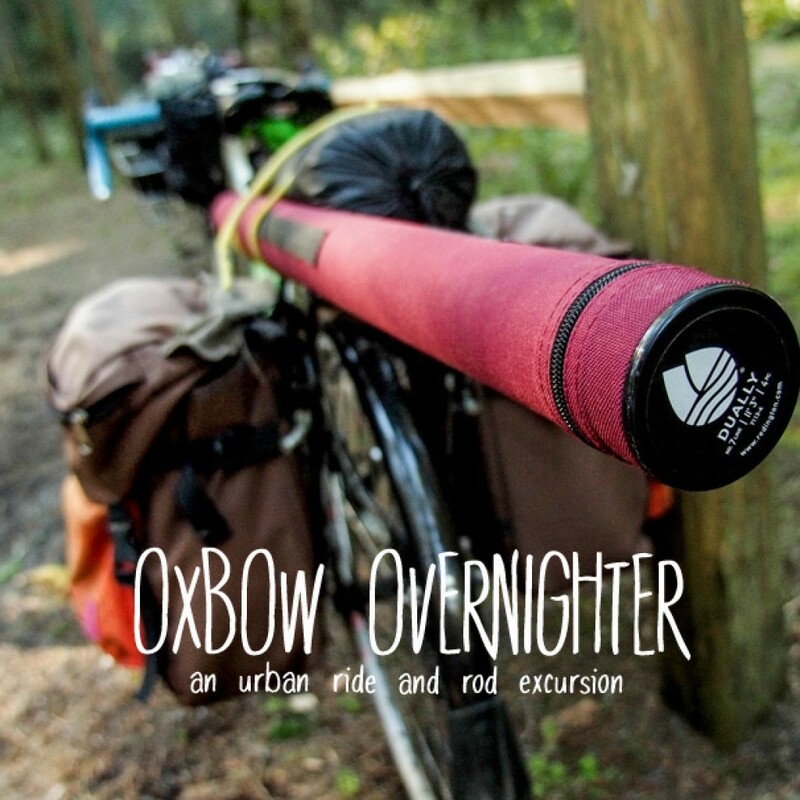 The Oxbow Overnighter is a great beginner-intermediate ride. What prevents it from being completely beginner/family-friendly is the crossing at Hwy 26 and The Hill. Though not particularly harrowing, those two features demand a little more attention. It is a remarkable destination that you can reach in fairly short order from Portland by bike and MAX. 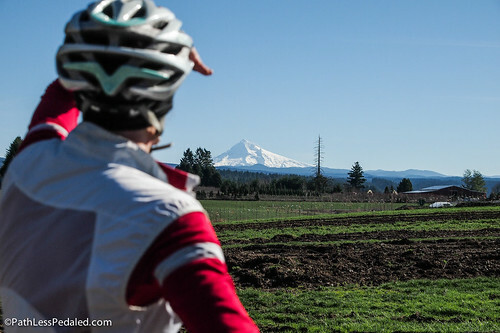 On longer summer days, it begs to be ridden the entire way from Portland. 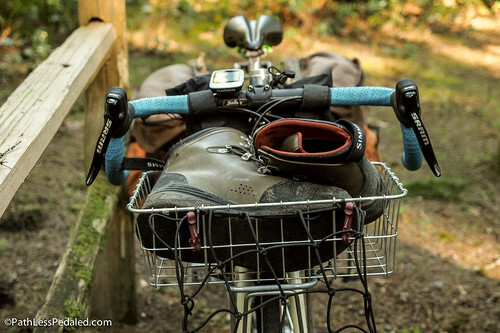 The Sandy River is a great attraction and if you like to fish as well as bike, this trip offers both great rural riding and a chance to hook into some amazing fish. love oxbow (other than the hill). just wish it had a hiker/bike camp!